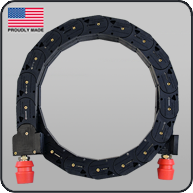 Featuring the same innovative concept as the fixed radius Wire Wizard® Guide Modules, the Guide Module® FLEX System is designed especially for welding applications using a traversing axis, gantry or boom. 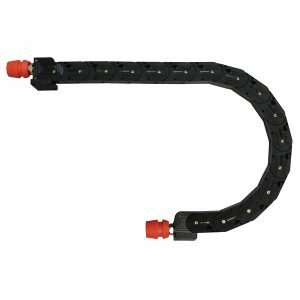 The FLEX utilizes a series of rollers with bearings to eliminate skid friction on the wire, providing a smooth, consistent wire feed. Ideal for applications utilizing igus® Track Systems. 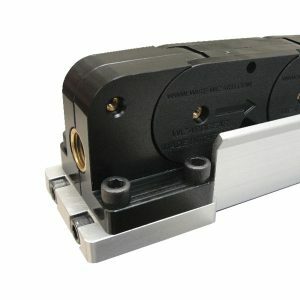 Featuring the same innovative concept as the fixed radius Wire Wizard® Guide Modules, the Guide Module® FLEX System is designed especially for welding applications using a traversing axis, gantry or boom. The FLEX utilizes a series of rollers with bearings to eliminate skid friction on the wire, providing a smooth, consistent wire feed. 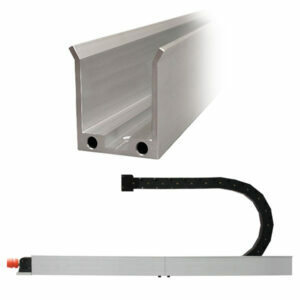 Ideal for many applications utilizing igus® Track Systems. Compatible with solid wires (ferrous or non-ferrous) .035 to 1/16” (0.9–1.6mm). End caps (sold separately) are 1/4″ NPT-F threaded to fit A-4 style quick disconnects (not included). Patent pending design. 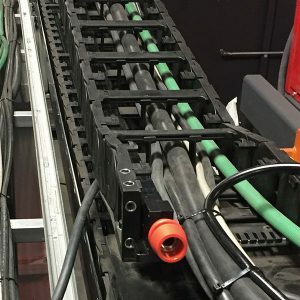 When building custom lengths of FLEX Modules, end caps are required. Each kit includes one of each end style cap. Each end cap is 1/4″ NPT-F threaded to fit A-4 style quick disconnect fittings. Note: End caps are included on 5 or 10 ft pre-assembled sections. 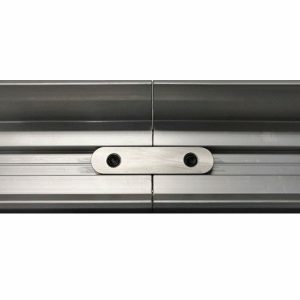 Each splice kit contains a channel insert and attachment hardware for connecting two sections of aluminum mounting channel for the Wire Wizard® FLEX Guide Modules. 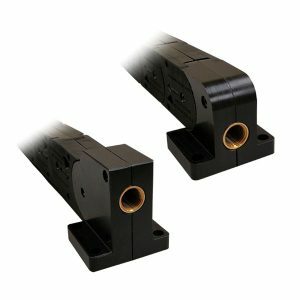 Each end cap mounting kit contains the necessary attachment hardware to mount Wire Wizard® FLEX Guide Modules to the end of the mounting channel. Wire Guide Caps are required for initial wire feeding when using Wire Guide Modules with cored wires. Simply crimp the guide cap onto the end of the wire and feed wire to the feeder. Guide Caps may also be used with other wires to avoid hang-ups when initially feeding wire from a new package to the feeder. 10 caps/pkg.